The "years of climate departure" for various cities across the globe. (Image: University of Hawaii/Abby Frazier)If global warming continues its trajectory, the year average temperatures surpass historical norms is just over a few decades away, bringing huge threats to global biodiversity, a new study shows. Researchers at the University of Hawaii, Manoa created an index based on 39 climate models used in a dozen countries, and compared that data to the extreme records from 1860 through 2005. “We looked at the minimum and maximum values that occurred in that 150-year window and that’s how we set our bounds of recent historical variability,” explained Ryan Longman, a doctoral student who worked on the analysis. The researchers were then able to come up with the "year of climate departure," and found that the worldwide average for that date was 2047, meaning that every year after that point will be as warm or warmer. In other words, it's the date "when the old maximum average temperatures become the new minimum temperatures." "The results shocked us," Camilo Mora, the study's lead author, said in a statement. "Regardless of the scenario, changes will be coming soon. Within my generation, whatever climate we were used to will be a thing of the past." While the Arctic and Antarctic have been the subject numerous reports on the effects of climate change, the new study shows how small temperature changes in the Tropics could have massive impacts. Because the tropics have less variability in temperature to start with, it takes less of a shift to push temperatures there beyond the norm. On the other hand, temperatures will indeed surge most in the Arctic and Antarctic, but there’s already more natural climate variability at those locales to begin with. This is a huge concern, because wildlife biodiversity is consistently highest at the tropics, and most of the world’s biodiversity hotspots are located there (tropical rainforests, for instance, are estimated to cover less than 2 percent of the Earth’s surface area yet contain roughly 50 percent of its plant and animal species). If, historically, these ecosystems evolved in the presence of relatively little climatic biodiversity, it follows that they might be less capable of coping with swings in temperature and adapting to survive. "Extinctions are likely to result," warned Ken Caldeira of the Carnegie Institution for Science's Department of Global Ecology. Caldeira, who was not involved in the study, added that "Some ecosystems may be able to adapt, but for others, such as coral reefs, complete loss of not only individual species but their entire integrity is likely." In addition, the study found that oceans already passed their historical extremes in acidification in 2008. "Scientists have repeatedly warned about climate change and its likely effects on biodiversity and people," said Mora. "Our study shows that such changes are already upon us." Still, Mora is hopeful that the findings can be a catalyst for change. "These results should not be reason to give up. Rather, they should encourage us to reduce emissions and slow the rate of climate change," stated Mora. "This can buy time for species, ecosystems, and ourselves to adapt to the coming changes." 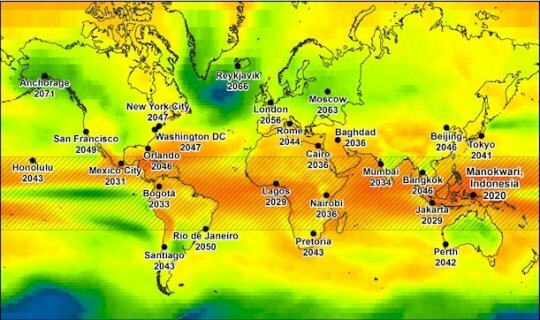 The study found that under an "emissions stabilization scenario," the "year of climate departure" could be pushed back—to 2069.